This doorway chin up bar could be used for sit ups, push ups, pull ups, dips, leg raises and more, strengthen entire body muscle. The pull up bar is designed to fit standard doorways 24'' - 36'' (61cm - 91.5cm). 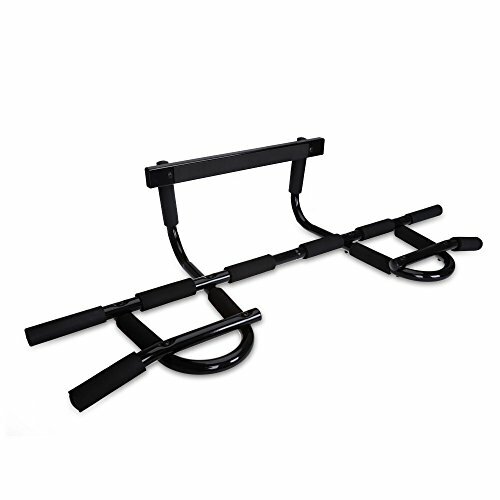 MULTI FUNCTIONAL - This chin up bar could be used for sit ups, push ups, pull ups, dips, leg raises and more. There are 12 grip position allow gym lovers to perform?different exercises, strengthen entire body muscle such as shoulders, back, arms, abs, and much more. FIT DOORWAYS 24'' - 36'' WIDE - The pull up bar is designed for home gym, exercise and fitness, greatly fit standard doorways 24¡ - 36¡ (61cm - 91.5cm). Men and women with this workout bar at home could enjoy a nice home gym any time. EASY TO ASSEMBLE & INSTALL - The doorway chin up bar comes with a slip in design which is easy to be assembled and installed. Remove the exercise bar from your door way in seconds when not in use. QUALITY STEEL FOR SAFETY - The doorway pull up bar is made of excellent quality high grade steel, weights 8.37lbs (3.8kg) and holds up to 440lbs (200kg). The doorway trainer is strong and durable, hard to be deformed under pressure and not cause damage to doors or wall as well.